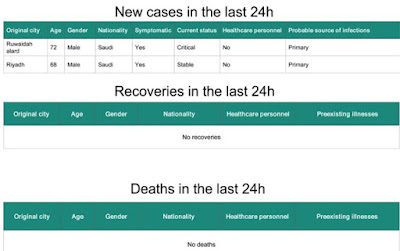 The recent uptick in MERS cases continues, with 2 more cases announced today, both elderly males listed as primary cases, with one stable and the other in critical condition. 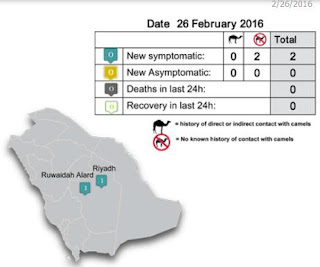 While some may have had zoonotic (i.e. camel) exposure - for many the source of infection is unknown . Over the past 3 years, roughly 40% of all Saudi cases are listed as either `primary’ or as from an undetermined origin. 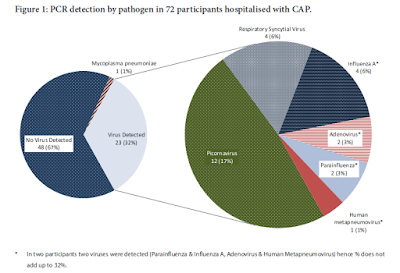 As mild and/or asymptomatic carriage of the MERS virus has been frequently observed, limited unrecognized community spread of this virus is considered a possibility (see The Community Transmission Mystery and WHO Guidance On The Management Of Asymptomatic MERS Cases).